Sign up to our newsletter and we will keep you up to date with Wobblophones! You can unsubscribe at any time by following the link included in each newsletter. 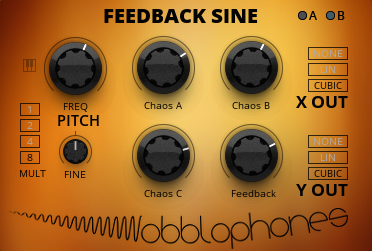 Feedback Sine: a chaotic generator that can sound like a guitar with feedback, an angled grinder or even a plain old sine oscillator. 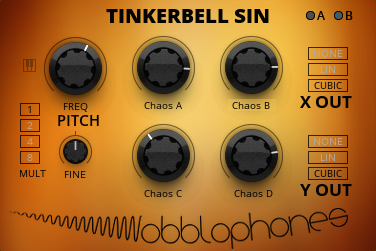 Tinkerbell Sin: based on the classic Tinkerbell chaotic map, this generator has a relatively high frequency, but tends to remain somewhat “pitchy”. De Jong Chaos: runs the De Jong strange attractor. It tends to produce lower frequency outputs than the other two, while also sounding a bit more gentle when properly chaotic.